Billy Sing was biracial, born to a Chinese father and an English mother. He served as an Australian trooper in World War I, and won the Distinguished Conduct Medal for his actions. 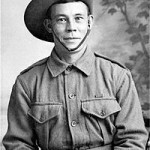 His life and heroic feats in the war is set to be made into a popular drama by director Geoff Davis called, The Legend of Billy Sing, however Davis chose his own son to play the part of Billy which has angered the Chinese-Australian community. The director said that he could not find a 60 year-old Chinese actor to play Billy’s father and therefore he had to opt for a white actor which meant that Billy too had to be played by a white actor. There are many examples of western films in general where history is portrayed by white-skinned actors when clearly the parts were meant for darker-skinned people. The Ten Commandments, Sinbad, Anthony and Cleopatra to name just a few where white actors played roles which clearly portrayed the indigenous people of the Middle East, India and Africa. At least in that era of overt racist discrimination in film there are excuses, but in 2010 the excuses are wearing thin. In December 2009 Disney made history by making a cartoon based on a black princess. Princess Tiana, Disney’s first black princess appeared in The Princess and the Frog. However, what many people in Britain will probably not be aware of is that during the making of this cartoon Disney was bombarded with race row after race row. Disney had to revise the storyline after a barrage of protests from the African-American community regarding its initial plans, which was to feature a black female character Maddy as a chambermaid working for a white southerner. Ironically enough Maddy’s voodoo priestess fairy godmother helps her to win the heart of a white prince, but the white prince must first rescue her from a voodoo magician. In the revised storyline the film is set in 1920’s New Orleans, with Tiana as a waitress who dreams of owning a restaurant, persuaded to kiss a frog which is really a prince and gets turned into an amphibian after the spell backfires. The Prince was not a dark-skinned African which was an issue for some African-Americans. Whatever people think about the cartoon the issues which repeatedly comes to the surface when western filmmakers portray history or invent characters in film is the subtle way in which European ideology is embedded in their films. Whether it is the Princess and the Frog, Avatar, or The Blind Side with Sandra Bullock, a subtle ideology of whites coming to the aid of darker skinned people still underpins the narratives of major movies, and in 2010 this is unacceptable. The Chinese-Australians have a right to be angry but while the movie industry continues to be dominated by western players these negative portrayals will continue. This entry was posted in Entertainment and tagged Billy Sing, Chinese-Australian community, Chinese-Australian war hero, Princess Tiana, The Legend of Billy Sing, The Princess and the Frog. Bookmark the permalink. Avatar, directed by James Cameron, was a racist film as well. In it they were making the good guys ‘white’ as usual.